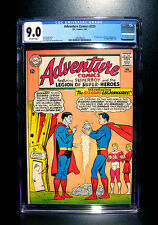 1961 DC Comics SUPERBOY No. 89 "Superboy's Big Brother!" Comic books are not graded, SOLD AS IS. The Adult Legion. Tales of the Legion of Super-Heroes / comic story / 22 pages. --from DC from 1967----- --. ----------------------- ----------------------------------------------------- - grade vf-. Superboy / comic story / 8.67 pages. Pete Ross discovers Superboy's secret ID. from Superboy (DC, 1949 series) #90. Tales of the Legion of Super-Heroes / comic story / 16 pages. --from DC from 1966----- --- -. The 2nd app of the Legion Of Super-Heroes. 2nd appearance of Legion, Saturn Girl has brown hair. --from DC from 1959------- ----. Prisoner of the Super-Heroes. We will take great care in processing your order. From DC from 1961------- a key ---- cover Curt Swan (Pencils) Stan Kaye (Inks) Gravity Girl of Smallville (Sequence 1 - Story, 13 pages ) Feature Story: Superboy Credits: Robert Bernstein (Script), Curt Swan (Pencils), Stan Kaye (Inks), ?. Superboy / comic story / 8 pages. Credits Script: Otto Binder Pencils: Curt Swan Inks: Ray Burnley. Credits Script: Otto Binder Pencils: Curt Swan Inks: George Klein. Credits Script: Otto Binder Pencils: John Sikela Inks: John Sikela. First appearances: Dream Girl, who joins & resigns from Legion. 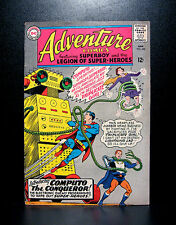 Adventure Comics #317 Legion of Superheroes Vol 1 - J. Forte -1964 gd. Though she is rejected, she participates in a mission and is elected to the Legion Reserve. Feature Story: Tales of the Legion of Super-Heroes. --from DC from 1967----- --. Character appearances The War of the Legions! 1ST DUEL WITH LUTHOR. "SUPERBOY". 80 PG GIANT #10. I grade as accurate and tough as possible-. 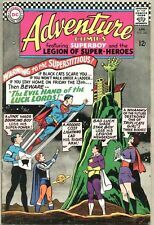 Adventure Comics #318 Legion of Superheroes Vol 1 vg-. - J. Forte -1964 Title - The Mutiny of the Legionnaires! W: Edmond Hamilton; P&I: John Forte; L: Milton Snapinn; E: Mort Weisinger Story: Sun Boy succumbs to space fatigue and turns on the Legion. Superboy's Moonlight Spell. Superboy / comic story / 8 pages. Superboy turns to evil under the influence of a gas he accidentally created. from Superboy (DC, 1949 series) #65. Tales of the Legion of Super-Heroes / comic story / 16.33 page. We are collectors not dealers and do not feel competent grading, therefore the pictures you see are of the actual comic. Feature Story: Tales of the Legion of Super-Heroes. - ----cover Neal Adams ------------. --------check out the pic for a great look---------------------------------------------------------------------------------------------------------------- ----------------------------------------------------- - grade gd . Feature Story: Superboy. last Superboy in Adventure for a decade. 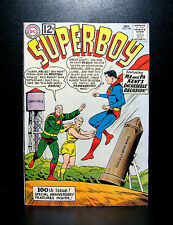 Reprinted: from Superboy (DC, 1949 series) #41. Feature Story: Tales of the Legion of Super-Heroes. --from DC from 1966----- --- -. The Execution of Matter-Eater Lad. From DC from 1961------- a key ---- cover Curt Swan (Pencils) Stan Kaye (Inks) The Secret of the Seventh Super-Hero! Then war breaks out. one pagers ----- --check out the pic for a great look---------------------------------------------------------------------------------------------------------------- ----------------------------------------------------- - grade vg. (Sequence 1, 8,66 pages ) Feature Story: Superboy Credits: Otto Binder (Script), George Papp (Pencils), George Papp (Inks), ?. (Colors), ?. (Letters). ----- The Doom that Destroyed Clark Kent! (Sequence 3, 9 pages ) Feature Story: Superboy Credits: ?. Feature Story: Superboy. 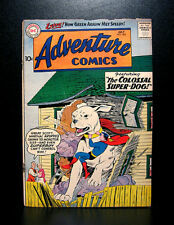 Reprinted: from Superboy (DC, 1949 series) #51. The Weddings That Wrecked the Legion. Feature Story: Tales of the Legion of Super-Heroes. --from DC from 1965-----. ------------------------------------- ----------------------------------------------------- - grade vg. 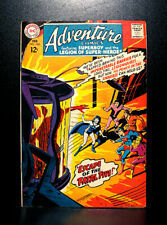 Comics individually bagged and boarded, ADVENTURE COMICS #341 344 345 347 348 360 6 Book LOT DC COMICS Silver Age (VG/FA). See pictures for more information and details. Superboy; Krypto; Jor-El (flashback); Ma and Pa Kent. Krypto contracts Kryptonian rabies. Feature Story: Superboy. Lucky Lucifer, the Gambler who never loses, takes on Superboy. Superboy; Lucky Lucifer; Ma and Pa Kent. Feature Story: Superboy. 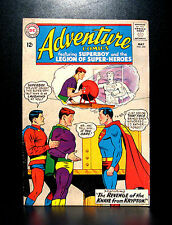 Ultra Boy must discover Superboy's secret identity as an initiation test for the Legion. Reprinted: from Superboy (DC, 1949 series) #98 (July 1962). cover Curt Swan (Pencils) Neal Adams (Inks). Cover Nick Cardy. Superboy / comic story / 14 pages. Superboy / comic story / 13 pages. Superboy [also appears as Clark Kent]; Lana Lang [Gravity Girl]; Professor Lewis Lang; Mrs. Lang; Krypto; Martha Kent. Credits Script: Jerry Siegel Pencils: George Papp Inks: George Papp. The Red K causes Superboy to release the Phantom Zone prisoners. Characters: Superboy; Lana Lang; Phantom Zone Villains; Superboy Revenge Squad; Red Kryptonite; Ma Kent; Pa Kent; Vakox; Kru-El; Gra-Mo. Othar of Thrann brings Superboy and many heroes from other worlds to his planet because they don't have any heroes of their own. Cover Curt Swan (Pencils) George Klein (Inks)----------------------------------------------. Grade isvery good to fine 5.0 . Characters: Superboy; Kandor; Ma Kent; Pa Kent; Varn (intro); Superboy robots; Kandor Look-Alike Squad; Vol-Don; Fortress of Solitude. Characters: Superboy; Krypto; Superboy Revenge Squad; Rava; Red Kryptonite. Superboy's Greatest Gamble! Feature Story: Superboy. Superboy as Chuck Kibbee picks two crooked carnival workers to be his new foster parents. Superboy; Ma and PA Kent; Ron Zero; Belle; Polar Boy. Krypto; Superboy; Lana Lang; Zkor. Characters: Superboy [Clark Kent]; Mr. Mxyzptlk; Jonathan Kent; Martha Kent. Superboy / story / 9 pages. Characters: Superboy; Superman. Superboy / story / 7.66 pages. Superboy / story / 8 pages. cover Curt Swan, Sheldon Moldoff.